For once it's not about trade wars... but the alternative is hardly better. European stocks tumbled most in a month, following Asian shares lower following contagion fears that Turkey’s economic problems will spill over into the euro zone and beyond. The Euro sank, while the safe haven dollar advanced alongside Treasuries, with the 10Y back under 2.90%. The Turkish Lira initially plunged and fell 45 big figures, with the USDTRY hitting a record high of 6.3005, or up more than 11%, before holding below 6.0 for the bulk of the session. As described earlier the collapse started around midnight EDT when the FT reported that the ECB Single Supervisory Mechanism warned that BBVA, UniCredit and BNP Paribas are particularly exposed to a TRY selloff, and even though it "does not see situation as critical yet", it warned that the risk is that Turkish borrowers may not be hedged against TRY weakness and begin to default on foreign- currency loans. There is some hope that Turkish President Erdogan's speech at 12 p.m. London time will calm matters but his earlier ad hoc comments did not give much room for optimism. Speaking outside a mosque earlier today, Erdogan told followers “Don’t forget this: if they have got dollars, we have got our people, our right, our Allah." Commenting on the statement, Bloomberg macro analyst Stephen Kirkland said that it signals he’s sticking to a nationalist message and is uninclined to deliver the hard measures Turkish assets need, which according to some analysts such as ADM's Marc Ostwald include a 500 bps rate hike and an IMF bailout. As a result, option markets are now pricing in a one-in-five chance of USD/TRY reaching 7 per dollar in a month, from about 1% probability yesterday. ... as the DXY spiked to YTD highs amid a broad flight to safety with the USD bid seen across all pairs. The scramble for safety meant that both USTs and bunds rallied however in a more contained manner and the 10Y bund yields were lower by ~3.5bps. In equities, Europe's Stoxx Europe 600 Index dropped with European equity markets selling off steadily as banks underperformed with BBVA, UniCredit and BNP Paribas - the three banks named by the ECB - in focus as all three fall 3.5-4.0%. Mining stocks also weaker as Russia considers a new mining tax of $7.5b, which also weighed on metals across the board. U.S. equity futures declined alongside shares from Asia to Europe. Asian equity markets were also mostly negative with sentiment subdued. The ASX 200 (-0.1%) and Nikkei 225 (-0.7%) were lower with Australia weighed by weakness in energy stocks, while Tokyo trade failed to benefit from stronger than expected GDP amid a firmer currency. Elsewhere, Shanghai Comp. (-0.1%) and Hang Seng (-0.4%) traded choppy amid a lack of fresh drivers and after the PBoC refrained from operations again for a neutral position for the week. As has been the case for much of 2018, geopolitical tensions between the U.S. and other countries had set the tone for markets this week, with the latest leg of the lira’s downward spiral triggered by a diplomatic row with America. Earlier in the week, China responded to the Trump administration’s latest trade war volley with additional tariffs of its own. The ruble hit a two-year low after the U.S. announced new sanctions on Russia over the March 4 nerve-agent attack on a former double agent in the U.K.
Asian equity markets were mostly negative with sentiment subdued after a lacklustre lead from Wall St. where weakness in energy and financials dragged the DJIA and S&P 500, while the Nasdaq just about remained afloat to notch its 8th consecutive gain. ASX 200 (-0.3%) and Nikkei 225 (-1.3%) were lower with Australia weighed by weakness in energy stocks, while Tokyo trade failed to benefit from stronger than expected GDP amid a firmer currency. Elsewhere, Shanghai Comp. (flat) and Hang Seng (-0.8%) traded choppy amid a lack of fresh drivers and after the PBoC refrained from operations again for a neutral position for the week. Finally, 10yr JGBs were higher with demand spurred by losses in riskier assets and with the BoJ also present in the market for nearly JPY 800bln in JGBs. PBoC skipped open market operations and were net neutral for the week vs. last week's CNY 210bln net drain. European equities have started the day negative (Euro Stoxx 50 -1.4%) as amid reports the ECB is expressing concerns of a weak TRY on European banks. This is pressuring European banks as a whole (STOXX® Europe 600 Banks (SX7P) -1.7%) as investors are repositioning into safe-haven assets and away from the financial sector, which is the current sector underperformer. BNP Paribas (-3.7%), BBVA (-3.3%) and UniCredit (-3.1%) are bringing up the rear of the Stoxx 600 on the back of high exposure to Turkish assets. In FX, the highlight was the TRY with almost relentless selling early Friday, to the point of a full-on capital flight at one stage, saw the Lira collapse to new all time lows vs the Usd with vendors and price feeds quoting levels for the pair anywhere between 6.0000-50 in fast, if not frantic market conditions. However, some respite for the Try ahead of and after Turkish current account data that was slightly better than forecast in the event, but the focus now very much on speeches from President Erdogan (midday and 14.30BST), and more importantly the Finance Minister’s new economic model (12.30BST). Usd/Try back under 6.0000, but only just. DXY - The index is just off best levels, but riding high near fresh 2018 peaks around 96.182 and still over the big figure amidst widespread Dollar gains, bar vs the safest of safe-haven currencies, Jpy as the aforementioned Lira and EM meltdown spills over to majors. Technically, 96.512 is next on the radar, assuming no intervention to stop the rout and/or a major upset for the Greenback independently (weak CPI data?). JPY - As noted, the exception to the rule, as Usd/Jpy trades mostly below 111.00 on risk-off positioning and the Jpy is also boosted by stronger than forecast Japanese GDP data overnight. Chart-wise, 110.53 represents nearest support and bids/stops are likely situated around 110.50. In commodities, oil is set for its 6th weekly loss as the crude complex is being hit by a rising USD, and risk aversion with both WTI and Brent down ~0.8% on the day, and Brent set for a near 2% and WTI looking at a near 3% fall for the week. In the metals complex, gold is down and straddling the USD 1210/oz level, as the rising dollar is hitting the gold market, which is looking at its 5th consecutive weekly fall. Copper has given up gains seen in early trade and is currently down 1.1% as an 11.3% fall in copper inventories seen by ShFE over the past week has not counteracted the USD hitting 13 month highs. Aluminium is also down 0.5% on the day. IEA raise their 2018 oil demand growth forecast by 110k BPD to 1.49mln BPD, and see risks to 2019 oil demand growth from trade disputes and rising prices if supply is constrained. Looking at the day ahead, the highlight is likely to be the July CPI report in the US. Prior to that we get the preliminary Q2 GDP reports in the UK. June industrial production data is also due out in France and the UK as well as June trade data in the latter. In the evening we'll also get the July monthly budget statement in the US. Gazprom will report earnings. Markets are undoubtedly quiet at the moment but there are some big moves still in Turkey and Russia that are preventing everyone from enjoying the summer. Firstly the S&P 500 closed -0.14% after a dip in the last 15 minutes before the bell but the index again traded in a fairly narrow 0.37% range for the day - the 8th lowest this year. Meanwhile the Turkish Lira dropped -5.15% to a fresh record low (YTD -46.2%) and the 13th worst day since 2000. Ankara’s jailing of the America pastor and the associated diplomatic row continues to hurt the country’s assets. 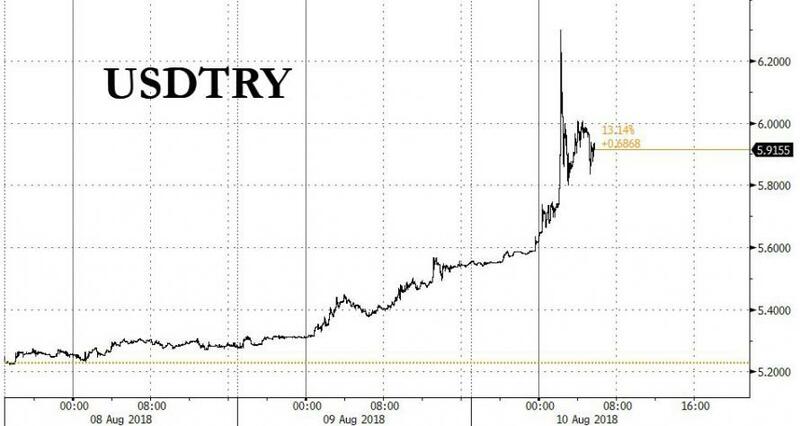 Not even the Turkish Treasury and Finance Minister Berat Albayrak’s office saying that the government would curb sovereign borrowing by reducing the GDP growth target to under 4% from 5.5% had an impact beyond a brief and small intra-daytick up in the Lira. President Erdogan speaks today at 2pm local time so it’ll be interesting to see if anything important comes from that. Meanwhile the Russian Ruble fell -1.72% (YTD -15.7%) to the lowest since April 2016 as the prior night’s US sanctions continued to dampen sentiment. Countries that are in a diplomatic battle with the US at the moment (e.g. China, Turkey and Russia) seems to be suffering in the markets. The main highlight today is US CPI. DB expects core inflation (0.23% month-over-month) to rebound in July after a few softer monthly prints. According to our team, over the past three months, core CPI has risen at an annualized rate of only 1.74%, well below the year-over-year and 6-month annualized rates which are both near 2.3%. Their forecast is supported by recent firmer readings for alternative inflation gauges and expectations for a rebound in a few categories that have been unusually soft in recent months. A print in line with DB’s forecast would lift the YoY rate for core CPI inflation to 2.32%, which would support the long-standing house call for two more rate hikes this year. 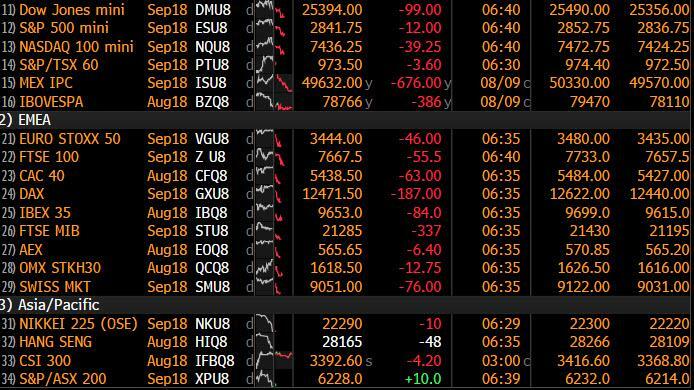 Ahead of this, this morning in Asia, markets are retreating modestly with China’s CSI 300 broadly flat (+0.02%) while the Hang Seng (-0.45%), Nikkei (-0.72%) and Kospi (-0.66%) are all down as we type. Meanwhile futures on the S&P are pointing to a softer start while the Chinese Yuan is resuming its decline (-0.2%). Datawise, the rebound in Japan’s Q2 GDP was stronger than expected at 0.5% qoq (vs. 0.3% expected), leading to an annualised growth of 1.9%. Back to other markets performance from yesterday. In the US, the Nasdaq edged up for the 8th straight day (+0.04%), closing in on matching its prior winning streak of 9 days in late September 17. Meanwhile Tesla fell for the second day (-4.83%) and was down -9.0% from its intraday high a few days back, in part as investors scrutinised the potential to take the company back to private ownership. Notably, Tesla rose c2% in after hour trading though after CNBC reported that its Board of Directors plans to meet with financial advisers next week to explore taking the company private, although Reuters cited unnamed sources which noted the board has not yet received a detailed financial plan from CEO Musk. So one to watch. In Europe, the Stoxx 600 reversed earlier losses to close +0.09% as consumers stocks benefited from better than expected results from Adidas (+8.6%) and Cineworld (+10.7%). Across the region, the DAX (+0.34%) and CAC (+0.01%) nudged higher while the FTSE (-0.45%) gave back some of its gains from the prior day. Over in government bonds, core 10y yields were around 2bp lower (Bunds -2.3bp; Gilts -1.9bp) while treasuries outperformed (-3.4bp), in part following a weaker than expected PPI print (more below). Turning to currencies, the US dollar index firmed 0.43% to a fresh 13 month high while the Euro and Sterling fell -0.71% and -0.45% respectively. In commodities, WTI oil softened further (-0.19%) while precious metals were little changed (Gold -0.12%; Silver +0.11%). In other news, Business Insider reported that some member states in the EU are ready to allow UK to remain in the single market for goods while opting out of the free movement of people if UK agrees to replicate all environmental, social, and customs rules in addition to those set out in her so-called Chequers proposals. The potential trade-off will apparently be discussed at a special meeting of all 28 leaders in Salzburg next month. It doesn’t seem likely that the EU would be this generous at this stage and after a brief spike GBP largely ignored the story and closed -0.45% and -0.27% lower against the USD and EUR. Finally turning to the latest central bankers speak. The Fed’s Evans, one of the more dovish Fed members seems to be shifting his tone as he noted that “it would not surprise me…if we make a judgement to move to a somewhat restrictive setting” on rates, which he believes could be roughly 50bp above his 2.75% estimate of neutral rates. Nearer term, he believes “it could be one or two more” rate hikes for the year. Meanwhile he pointed to the economy’s “extremely strong” performance and he thinks “inflation expectations are going to catch up”. Back in the UK, the outgoing BoE policy maker McCafferty told the Guardian that wage growth might “creep up towards 4 percent-ish” in 2019, in part driven by a labour shortage and he sees “another couple” of rate hikes in the next 18 months to two years. Before we take a look at today’s calendar, we wrap up with other data releases from yesterday. In the US, the July core PPI (ex food & energy) was 0.1ppt below expectations, coming in at 0.1% mom and 2.7% yoy. The weakness was in part due to the decline in wholesale prices for apparel (-4.4% mom) and furnishings (-3.2% mom). Meanwhile, our US economists noted the healthcare component – used as an input in the core PCE deflator, was up just +0.03% in July leaving its annual growth rate steady at 1.7% yoy. Elsewhere the final reading for the June wholesale inventories was revised one-tenth higher to 0.1% mom. The weekly initial jobless (213k vs. 220k expected) and continuing claims (1,755k vs. 1,730k expected) remain near historic low levels and continue to reflect robust labour market conditions. Back in the UK, the June RICS housing survey reported that a net 4% of surveyors had seen house price increases over the past three months – up slightly from the June survey.